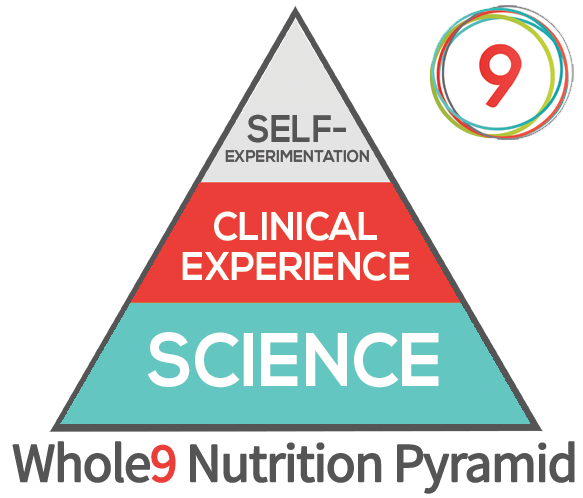 Based on the science as we understand it today, and our clinical experience with the tens of thousands of people who have completed our Whole30 program, we make some general recommendations as to which food groups may make you less healthy—including sugar and artificial sweeteners. Below, we’ll outline the basics of our case against consumption of added sugars in any form as part of your daily diet. But until you undertake your own self-experiment (via the Whole30) for yourself, you’ll never know for sure how consumption of added sugars are affecting how you look, how you feel, and your quality of life. When thinking of foods that provoke an unhealthy psychological response (including cravings), sugar comes to mind first. Because the sweetness of sugar is addictive, eating an excess amount is easy. The more we eat, the more we get acclimated to high levels, and the more we want. Artificial sweeteners are also commonly problematic, as they are hundreds of times sweeter than the sugar found in nature but lack any genuine nutritional qualities. Sugar (and studies suggest some artificial sweeteners) also disrupt the environment in our gut, specifically altering the delicate balance of “good” bacteria and “bad” bacteria. This condition (called dysbiosis) can lead to digestive distress and inflammatory symptoms like fatigue, body aches, and joint problems, and can worsen pre-existing inflammatory or autoimmune conditions. Numerous studies have associated the use of various artificial sweeteners with various health conditions, including cancer, migraines, autoimmune conditions, and neurotoxicity. There have not been enough long-term studies on humans to definitively confirm these associations or prove a causative relationship, but we recommend a cautious approach when confronted with data that suggests there may be a problem. With potential downsides and no significant advantages, we recommend avoiding non-caloric sweeteners in general. These manifestos are not intended to be a comprehensive dissertation of our research or recommendations. For more information on the psychological impact of our food choices, the effects of sugar and artificial sweeteners on health, and scientific references used to support our position, please refer to our book, It Starts With Food. To educate yourself on all the different names for “sugar” found on food and drink labels, download our free Guide to Sneaky Sugars. For my Whole 30 I have been struggling with this one the most (to my credit, I also was a light-heavy smoker and drinker, the prior influencing the latter ._.) so in being honest with myself, I do not think I have beaten the dragon just yet. I have a “sugar” question. Other than putting about a teaspoon of pure can sugar in my morning mug of coffee, I haven’t reversed another single change since reaching the end of my first 30 days. My question is – is that ok? I don’t want to undo what I’ve done… especially as it relates to supplying my body with a form of glucose energy (am I saying that right?). But if PCS is an okay alternative and in such a small amount, it sure does make my coffee lovely. And I am still completely free of any other sugar cravings. Any input would help! Thanks! f we are talking about sugar being bad for you then I think we should discuss what type of sugar is bad for you… Fructose. This is the form of sugar which is addictive and causes disruption to our body and which is basically turned into fat as our brain is not able to signal when it is full when we eat fructose. If you watch Dr Lustig’s talk ‘The Bitter Truth’ you will get more of a detailed understanding of this. I quit sugar over 6 months ago thanks to David Gillespie, who wrote ‘Sweet Poison’ and ‘Big fat lies’ – Again based on the premise that Fructose is the culprit. I quit sugar through a program run by Sarah Wilson in a 8 week quit sugar program. Essentially I have quit fructose BUT fructose is also found in many fruits (which is why I don’t over do it on fruits and only stick to certain low fructose fruits) and don’t touch things like honey or dates or dried fruits. @Lauren L: Battling sugar is one of the hardest things, in my opinion… harder, perhaps, than even alcohol or drugs. (After all, everybody eats!) Hang in there – many folks report it takes longer than a Whole30 to kick their sugar cravings, and keeping them from returning is often a life-long pursuit. But it does get better, I promise! 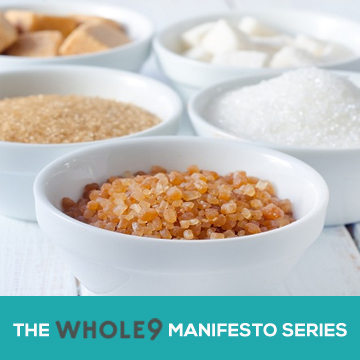 @Heather C: How you choose to reintroduce sugar (and in what format) after your Whole30 is entirely up to you. Sugar is one of those slippery slopes – is one teaspoon a day going to send you into metabolic derangement? Hardly. Will two? Three? Six? Twelve? At some point, it moves from “not so bad” to “pretty unhealthy” but I just don’t know where that line is – and it’s different for everyone. Since you asked, I really don’t see how a teaspoon of sugar in your coffee every morning is doing you harm, especially since you’ve got your sugar demons under control. I’m sure I get that equivalent of added sugars a day just from things like ketchup, coconut water, and the occasional piece of 85% dark chocolate. Furthermore, fructose is no different from other forms of sugar when it comes to the psychological impact of added sugars in our diets. To demonize fructose while suggesting brown rice syrup is A-OK misses the point of much of our argument against sugar – the way processed foods with added sugar messes with our brain, our taste buds, and our hormones (which, again, we outline fully in It Starts With Food). I understand where you are coming from in terms of quitting all sugars during the Whole30. As I mentioned in my comment above I did an 8 week quit sugar program previously and abstained from all forms of sugar during the program. And yes you’re right fruit is more than just fructose but if we are talking about sugar being sugar then even high levels of fruit can have the same affect on the body as say eating cake. I’m not saying that one should avoid fruit but that it should be eaten in moderation. As for brown rice syrup/dextrose to me these are my safe sugars. No I don’t use them everyday BUT if I need to use a form of sugar these are what I use. I disagree that fructose is the same as all forms of sugar, like I said if you watch Dr. Lustig’s talk as well as reading a myriad of other reports out there it is clear that fructose is the main focus. I don’t eat processed foods, I eat a 99% sugar free diet and I bake sugar free as well. To me brown rice syrup/dextrose are not harmful forms of sugar and like I said I don’t use them all the time. I say 99% because yes I have the occasional slip like most people. For people who have never quit sugar then I say yes abstain from all forms of sugar during the program. @Naz: Yes – you’ve hit the nail on the head here, with respect Heather’s question above. If you’re doing your best to eliminate added sugar as a rule, but once in a while want to sweeten something, then use whatever the heck you want – brown rice syrup, cane sugar, maple syrup, or honey. Use what you think is the best choice for you, and what’s going to make your food taste the most delicious! For me there really isn’t a safe sugar option, ever. I’ve battled with this lesson over and over and over (I could continue but I’m sure you get the point! )…I have to say during this last W30 something in my brain has finally clicked…it’s never going to be an option for me so I need to just learn to deal with the loss instead of the inner turmoil it costs me to try to manage “just enough to satisfy a craving”…it’s never enough even with the best laid reintroduction plan! I have always eaten and fed my family healthy, pure, whole foods, but I decided to implement the Whole30 to deal with my children’s food allergies. This basically meant removing sugars that I had been allowing, honey, maple, and the “healthy” (ha!) “All Natural” Ice cream we were having post dinner, Long story, short, we were able to pinpoint that my 2 year-old’s crazy, insane night terrors that had been taking place EVERY night for months were caused by sugar. They stopped immediately and went from every night to none at all. Their is no doubt at all as to the trigger. Unfortunately, I allowed her strawberries (a lot) the other night before bed and she had one for the first time since the discovery. I am afraid that the sugar in fruit might even affect her. Is this normal? Thank you! Love your book and your site! How do you guys feel about stevia as a calorie free sweetener? @Kelsi: It’s not a very common “side effect” of sugar, but it’s also not at all unheard of. Many kiddos are really sensitive to sugars, and will act out (tantrums, ADHD-like behavior, etc.) during the day as a result of consumption – your child has unpleasant consequences at night. I think your strawberry experience goes to show you how sensitive she is to sugar. I’d recommend fruit in small serving sizes, and always as part of an overall meal (with protein and fat, instead of all by itself) to slow the absorption. As she grows, she may be able to tolerate sugar and fruit better, but for now, if she’s doing so much better without it, then I think you’ve got your answer. @Natalie: Lots of people think Stevia is a great option because it’s “natural” and comes from a plant – but the little white crystals (developed in a lab) that you find in your packages of Stevia are the furthest thing from natural. In addition, your brain doesn’t care whether you’re loading up on real sugar or Stevia – the psychological impact of sugary foods and added sugars are the same. So, as we explain in our book, sugar = sugar = sugar from this perspective. In summary, the more you can do away with added sugars in your diet (real or artificial), the healthier you’ll be. Welcome, BlackOnyx, and thank Shen for us! We’re happy you found the Whole30 and our site. Thanks so much for taking the time to reply and your help!! I am just on day 3 of my whole 30 program and my entire body aches and I can’t sleep. I have been a sugar addict my entire life, now at 56 and going through menopause with very bad symptoms I decided to kick it. I believe it’s that important for my health. Are my “withdrawl” symptoms normal? They seem very extreme but I was an extreme sugar consumer, a big diet soda addict too. Janice, I’m afraid this is a very common experience for those “sugar burners” like you. Your body is used to running on sugar as fuel, and it’s not yet adapted to running on your othe fuel source (fat). This makes for a week or two of lethargy, cravings, hunger, headaches, crankiness, and general unpleasant “carb flu” effects. Make sure you are eating enough, staying well hydrated, and not pushing yourself too hard with exercise. This WILL pass, and soon you’ll be feeling better than you ever have! Hang in there, and consider joining our free forum for all kinds of support. http://forum.whole9life.com. I completely agree about the sugar craving and loved not having ANY sugar during my Whole30. Now that I am back in the real world, I will pay attention because yes, I will have sugar occasionally. My question is about heavy whipping cream. I read that it is better than half & half or milk because it is more fat than the (harmful) milk proteins, so I bought some to put in my tea – normally I would use half & half and a teaspoon or two of coconut sugar in my tea. I have found that with the heavy whipping cream I don’t need to use sugar at all! It’s not very sweet, but it takes the edge off the tea. Is this a viable alternative to putting sugar in my tea? By the way, I only drink tea once or twice a week. Oh, and I do NOT like coconut milk in my tea. I would also like to know about the Heavy Whipping Cream, because I also used half and half and sugar in my coffee. I’ve managed to quit the sugar, but not the half and half. I’ve tried alternatives like using coconut milk (bleh!) and also ghee (double bleh!) in my coffee and I’ve even tried it black. But I really miss the cream! So would the HWC be alright? I really don’t want to give up drinking coffee. It’s a morning ritual to have a cup with my husband. Heavy whipping cream is one of those things that we think is probably generally a good choice, but (as with everything) it depends. Heavy cream is still only about 35% milk fat – the rest is water, and some (a small amount) of milk proteins. These proteins are what can be problematic in those sensitive to dairy, which means some folks will tolerate some heavy cream just fine, and others will not. This is where the Whole30 comes in. If you’ve done a Whole30 and tested heavy cream in your reintroduction schedule (and done okay with it), I think you’re fine to keep some heavy cream (pastured and organic, preferably) in your coffee on a daily basis. If you notice continued exposure gives you issue, you may need to cut back or eliminate it altogether. But if you tolerate dairy well, then absolutely, heavy cream is a healthier option than any other form of milk, including half-and-half. Is heavy cream not Whole 30 compliant (when you are in the 30 days). I was under the impression from “It Starts with Food” that like clarified butter, ghee, cocnut milk, it is ok during the 30 days. I also thought from “It Starts with Food” that heavy whipping cream was Whole30 compliant. Nope. The Whole30 rules specifically state the only dairy product allowed during the program is clarified butter or ghee. Heavy whipping cream is excluded, as it still contains some milk proteins, and there is no “clarification” process to remove them. I tried coffee with coconut milk today, and I like it!! We have a section on doing the Whole30 as a vegetarian/vegan in our book, It Starts With Food. We also have some resources available online, and a shopping list for vegetarians/vegans as well. In summary, you can’t do the Whole30 as written without animal protein, but we do recommend changes you can make to increase the health of your veg*n diet. Concerning the reintroduction phase after Whole30. is there a particular reasoning behind the order of food groups that are reintroduced? That is, is it necessary to reintroduce dairy the first day afterwards, or can I skip ahead to a different food group, and then if I want to reintroduce dairy, can I do it at a later time? Thanks. We’ve actually restructured the order of our reintroduction protocol a bit–you can see our current guidelines here: http://whole30.com/finished. Our thought process is based on reintroducing those foods that are generally the least problematic to those which are the most problematic. However, you can choose to reintroduce food groups in whatever order or structure you want–you certainly don’t have to follow our recommendations. I’d just hold to the idea of only reintroducing one major food group at a time, so you can more effectively evaluate its effects. I was wondering if organic stevia leaf powder would be ok as a sweetener. It is green and uncristalized. I am also considering growing my own.